Employability Orkney is a registered charity that was established in 2006 to help provide a range of sustainable supported employment, training and volunteering opportunities for those with a barrier to gaining employment. This broad remit includes individuals with a learning disability, physical disability, mental health needs, alcohol/substance misuse needs, ex-offenders, care leavers, long-term unemployed and anyone who experiences a disadvantage in entering the labour market. Our social enterprise Restart Orkney sells good quality second hand furniture, household items and white goods at affordable prices. All profits made from shop sales go back into helping our local community. Restart Orkney also helps to protect our beautiful environment as many of the items donated to us would have otherwise ended up being incinerated. In this financial year 2017-2018 we have had approximately 126.598 tonnes of items donated to us and we have sold on approximately 102.412 tonnes. 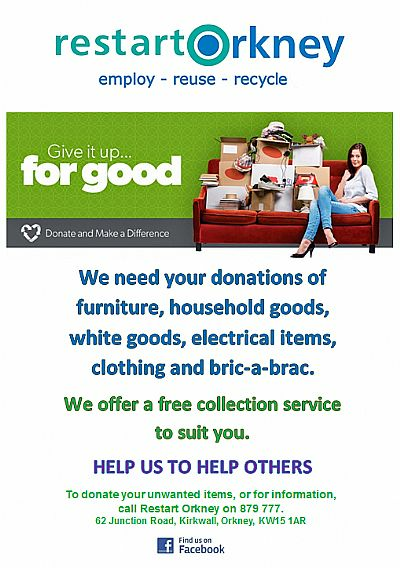 If you would like any further information or would like to donate please feel free to contact us on (01856) 879 777 or visit or showroom at 62 Junction Road, Kirkwall. Thank you to all our customers for helping us to continue to help others.